The River Thames has been a vital part of London since its beginnings as a Roman fort almost two thousand years ago. The buildings and monuments which cluster along its banks as it snakes its way down to the sea trace the city’s growth and mark the chapters of its history. So too, do the bridges which span it. London Bridge is the city’s oldest, dating back 2000 years to Roman times. 1000 years later, the invading Vikings, led by King Olaf, stormed the bridge to attack the settlement. The then Londoners fought to defend it until they were thrown into the river and drowned. In a final blow, the victorious Vikings torched the bridge which gave rise to the famous nursery rhyme “London Bridge is burning down”. Since then the bridge has been rebuilt many times. In 1968, when it was up for renewal, an American developer bought the old version, shipped it out stone by stone and reconstructed it in Arizona. Today London Bridge, although architecturally somewhat plain and unremarkable, is one of the city’s busiest and most important. Westminster Bridge, opened in 1750, was the first link between Westminster and the South Bank. It was rebuilt in 1862 in the same style as the Houses of Parliament and painted green to match the benches in the House of Commons. Built in 1769, Blackfriars Bridge takes its name from the Black Friars, the black-robed order of monks whose monastery sat nearby, on the north bank of the Thames, during the Middle Ages. The original bridge was demolished and rebuilt a century later but tile pictures of the first bridge remain in the passage which runs beneath it on the south bank. The first Hungerford Bridge, was a small foot bridge, built 200 years ago to allow the people of Lambeth on the south bank access to the north-side Hungerford food market, which was named after the family whose mansion was originally located there. 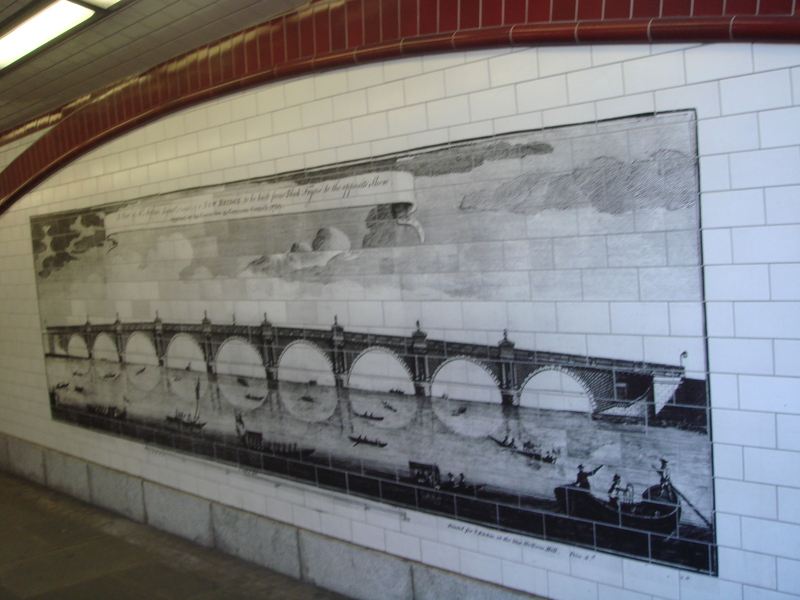 The foot bridge became a railway bridge when Charing Cross Station was built on the market site. The two Golden Jubilee foot bridges which flank the railway bridge were added to commemorate the Queen’s Golden Jubilee. Construction began on Waterloo Bridge in 1811. Originally it was to be named Strand Bridge as it connected the south bank with The Strand. However by the time it was completed in 1817, the Duke of Wellington had defeated Napoleon at Waterloo and it was the Bridge was named to mark his victory. Tower Bridge, which takes its name from nearby Tower of London, is a London icon and possibly the world’s best known bridge. Although it fits the style of the nearby Tower which dates back to the time of William the Conqueror, it was not built until the late 19th century, when increasing traffic in booming city created an urgent need for a new crossing lower downriver. The design was Horace Jones, the City Architect’s winning entry in an 1884 City Council competition. The bascules, or leaves, which can be raised to allow ships to pass on the river below, were the brainchild of engineer John Wolfe Barry. Millenium Bridge which runs between the Tate Modern Art Gallery is a suspension foot bridge, carefully designed and constructed with cables running along its sides rather than above it, so that it is low enough to allow a view of St Pauls’ Cathedral, yet high enough to allow ships to pass underneath. It was built, of course, to mark the new millennium. It is a picturesque, fascinating and not too taxing walk along the Thames bridges from Westminster passing under, or if you like over, Hungerford/Jubillee, Waterloo, Blackfriars, Millenium, Southwark, London and finally Tower. There are plenty of pleasant places to rest and catch the breath, lots of lovely cafes and quite a few pubs with spectacular views of the bridges and the river too.